Many regard this as one of the better rogue sets and for good reasons. 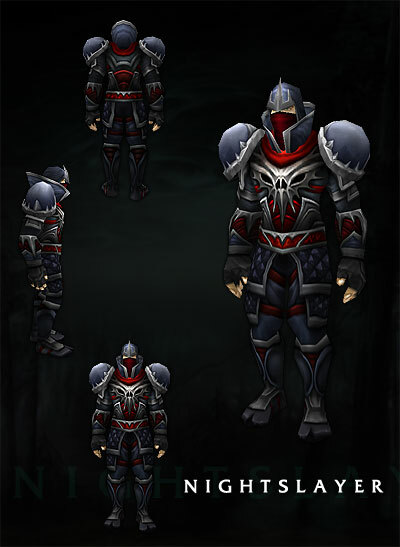 The Nightslayer set is one of the more classic sets, gathering its appeal from being more “rogue like” than having by crazy spikes and glowing “how do I stealth in this gear” light effects. So why is this set not in the top 10? That is a good question and many will dispute its place at 17. That said, there are some other great sets ahead of us and I only ask that we get to number 1 before you second guess its placement. Regardless of its actual ranking, there is no doubt, this is an amazing set that deserves a place as one of the top sets in all of Azeroth. My only wish is that Blizzard would recognize its status and show reverence to the fine artists that created it. This entry was posted on June 25, 2011 at 6:24 pm and is filed under General, MMO, Raiding, Role Playing, World of Warcraft. You can follow any responses to this entry through the RSS 2.0 feed. You can leave a response, or trackback from your own site. My favorite set EVA! but why only number 17?